Happy Tuesday book world! Short post from me today, as my most recent read can best be summed up with, “meh”. 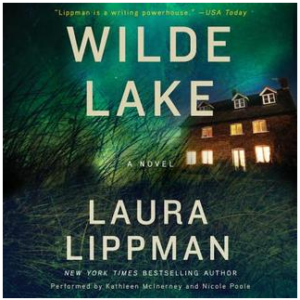 Wilde Lake by Laura Lippman, first published in May of 2016, had some moments of suspense but overall, I would give this book 3.5-stars. It was entertaining but fell a little short of being truly captivating. I listened to it on audiobook which was fine. They used two narrators to differentiate between present time versus flashbacks. The text mixed long-held family secrets together with a modern murder investigation. A lot was revealed over the course of the book that brings to mind the concept that no matter how perfect a family appears on the outside, for the most part, we all have secrets and skeletons in the ole’ family closets. I’m not sure I would really seek out other books by this author – as far as modern thrillers go, for me, this one fell a little short of the ‘thrilling’ part. In other news, I had to leave for work today with 10 pages left in Behind Closed Doors by B.A. Paris – now that one is a page turner!!! I hope everyone has a wonderful day and gets lots of pages read!